Darjeeling: The romance of the toy train and Land Rover came alive on Thursday as the two beauties of Darjeeling came together for a tango at a joint rally, enthralling people and reviving memories of 1969 blockbuster Aradhana. "What a sight, what a journey," exclaimed Sukhdeb Golder from Calcutta, echoing fellow tourists and residents. The scenes left many nostalgic about the film and the timeless song in which Rajesh Khanna is shown crooning " mere sapno ki rani" while driving in an open Jeep that travels alongside Sharmila Tagore on the toy train. However, some reality checks would be in order: Khanna was in an open Jeep, not a Land Rover. Also on Thursday, it was not a single Jeep as in the film but a line of 37 Land Rovers matching steps with the toy train. The Darjeeling Himalayan Railway (DHR), under which the iconic toy train runs, is a world heritage site. The Land Rovers of the 1954 make - all imported from England - are no longer manufactured and Maneybhanjyang, 27km from Darjeeling, has the highest concentration of such sturdy workhorses anywhere in the country. "We cannot say how many Land Rovers of this make are there in India. A few are there in Rajasthan. There might be some more in other parts of India but Maneybhanjyang has the largest number of this vintage," said Ashish Gupta, director of Cougar, an event management firm that organises rallies for the vehicles in India and is among the 22 lead specialists in the country trained by Jaguar Land Rover. The firm handed Rs 50,000 to the Singalila Land Rover Owners' Welfare Association as a goodwill gesture to tide over the loss the association suffered because of the 104-day shutdown during the statehood agitation. There are 42 Land Rovers in Maneybhanjyang that ferry tourists to Sandakphu, the highest point in Bengal. Land Rover enthusiasts, with support from Jaguar Land Rover, plan to organise an event at Maneybhanjyang in April to mark the platinum jubilee of the vehicle. "The first Land Rover rolled out from England on April, 1948 and we will mark the platinum year with a main event here," said Gupta, who had flown in from Delhi. He and his friends were not disappointed. On Thursday, the Land Rovers started from Maneybhanjyang and reached Ghoom station around 11am. After a wait for about 20 minutes, they began the 8km journey with a century-old steam engine with two bogies and a wagon attached. Traditional dances were performed along the route. "It was a wonderful ride and I feel good having participated in this rare event," said Samantha Dong, 28, the only woman driver in the rally who steered her grandfather's Land Rover. 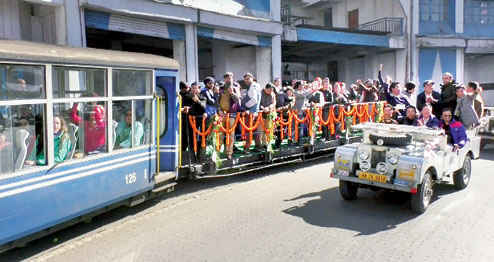 The romance of the toy train and Land Rover came alive on Thursday as the two beauties of Darjeeling came together for a tango at a joint rally, enthralling people and reviving memories of 1969 blockbuster Aradhana.